October is here and the last month has really flown by. Spur of the moment I have decided to do No Spend October. 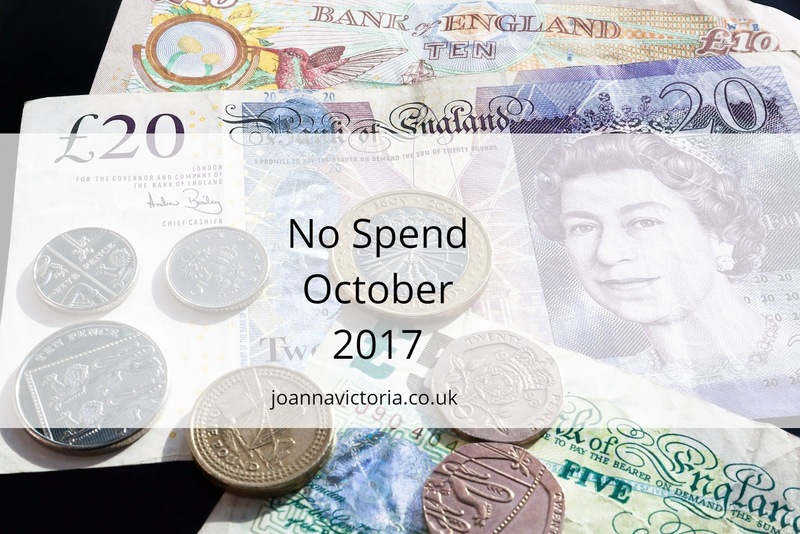 I really do need to cut down on my spending, so I thought by taking part in No Spend October this will really give me a kick start in curbing my spending. The rules are pretty simple from the first of October to the 1st of November no spending on things that aren't essential. All bills and personal bills such as my phone, insurance and Netflix are covered for. - I'll allow myself to buy chocolate/Hifi bars occasionally as I can't completely go without them. - If Blake needs anything for Pre-School. - Anything else non essential you can think of. I'll be making sure there are no shopping trips or online spending this includes no charity shops, ebay, facebook selling pages, no amazon (eek) no matter how much of a bargain something is. I'll share with you if I cave in and buy something I shouldn't and I'll also be sharing with you some of my ideas on things we have done. Here are some ideas below on how I am going to manage during the month. 8. If I do run out of books to read I can borrow from the library instead of buying. I know its not going to be easy especially with half term coming up at the end of the month and with Halloween around the corner too. I'd love to know if you will be joining in or if you have any tips or ideas for the month ahead for me. Good luck with this! I think it's a fantastic aim and I'm sure you will manage it over the course of the month! I'll be interested to see how you get on with this. I'm not sure I could last a month! Good luck with your no spend October, I should really try and do something similar myself. This sounds like a great idea, I really need to do this, I might have a no spend November! I should do this as well....I spend too much money myself and I need to really cut back on my spending. ooo I love this idea and this is something we need to do as well! Bit late for october but I think I will try september instead! Good luck with the no spend challenge. I really should do this as well. I need to cut down on my spending. Great list - I save a fortune by reading books already on my TBR list. I chuckled at you removing the Amazon app but it is actually a great idea. Such a fab idea..and much needed seeing as the spend of Xmas will only be a couple of months after this. I look forward to hearing how you get on! God I need to do this. We are so so broke this month and I don't get paid until the 15th! Help! Good luck with this Joanna, that looks hard but it's so easy to spend on non essentials isn't it? Oh wow good luck. It's not going to be easy but if you manage you should save a fair amount!!! Best of luck on your no spend month. This is such a great way to save and discipline yourself. I will have to do this next month so I can really start by November first. This is such a great idea and if it became a habit it wouldn't need to be per month as you can do it for the whole year. But with also some cheat days to treat yourself. Good luck with this! I really need to do something like this, as I spend too much on things I don't actually need. I should really do this... but moving into a new place makes it pretty hard to not spend as we need to get all the essentials! I might try this for November though.... it would be interesting to see how much money you saved. What a great idea. I have decided to actually work out a budget this month so I'm hoping that is going to help. Love the idea of a month of no spend though. This is a massive task but a great worthwhile undertaking just before the Christmas season. Good luck! Good luck, it's so hard to not buy all those little bits but will save so much money! Great idea. I'm saving for a house and very rarely treat myself now... but it will be worth it all, I hope! I would love to see how you get on as the month progresses. I tend to be a very sensible spender, but sometimes extra costs creep up on you no matter how sensible you are! Best of luck on your no spend month!! Oh wow good luck. I would save so much if I did this. I think I'm going to try this out in January! I am trying to save money too. I live in London so lunches at work can be expensive! Packed lunches are a must. Good luck with this i really need to do this too so think november might be a good one for me leading up to christmas!